It is May 5th, which in this part of the world means it’s time for Cinco de Mayo, a celebration of Mexican culture and heritage. Big part of any culture is the food, and Mexican food has been one of my favorites for years. So I could not sit this one out!!! My Cinco de Mayo tribute recipe is this Mexican Stuffed Mushrooms, that starts with large stuffing mushrooms and uses a stuffing with layers of flavors, all very evocative of what you might expect to find in pub nachos or a tortilla. These large, plump mushrooms are a perfect vehicle for the rich stuffing and what I like to do is roast the mushroom caps by themselves first, to get rid of extra moisture. And while the mushrooms are roasting, I focus on putting the stuffing together. As I mentioned previously, I don’t like vasting lovely bits of mushrooms – stems: I’m talking about you! – as there is lots of great flavor in them. 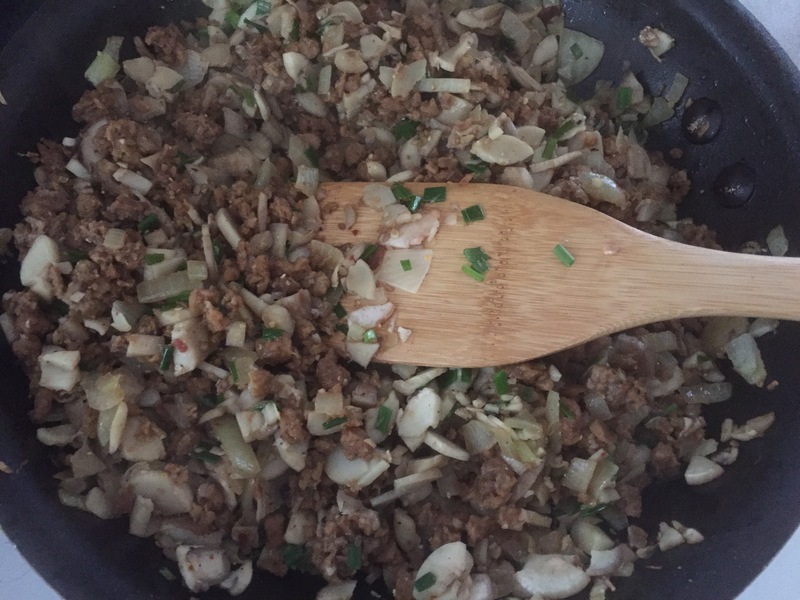 So, this stuffing uses all the mushroom stems finely chopped, and mixes them with just a bit of vegan ground beef substitute to maximize the umami flavor. Now in terms of getting a bit of Mexican flavors going, I applied a shortcut and went for a jar of store bought chunky salsa. You can definitely make your own, or go with any salsa flavor and heat level you enjoy. In case you are wondering, I used mild. 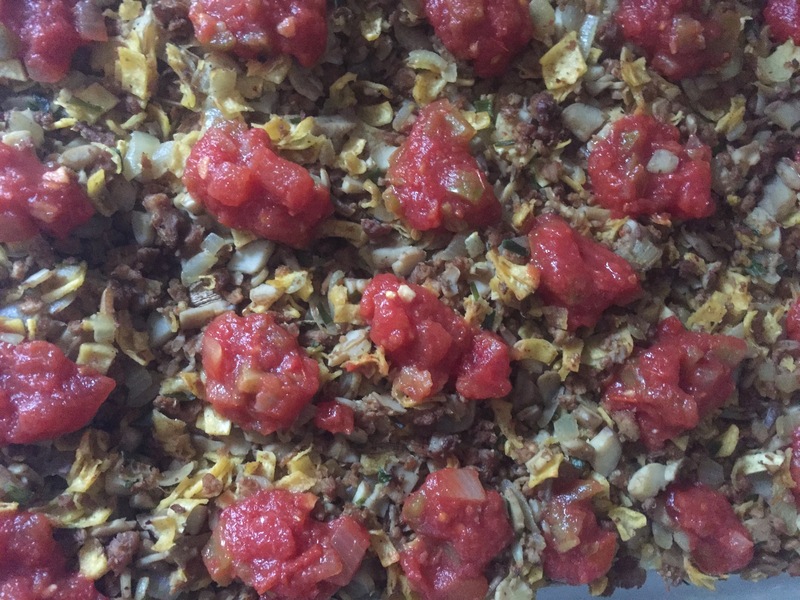 My final touch was to cut up some soft corn tortillas and add them to the stuffing. This adds a bit of texture and brings the flavors much closer to what you’d expect from a Mexican cuisine inspired dish. 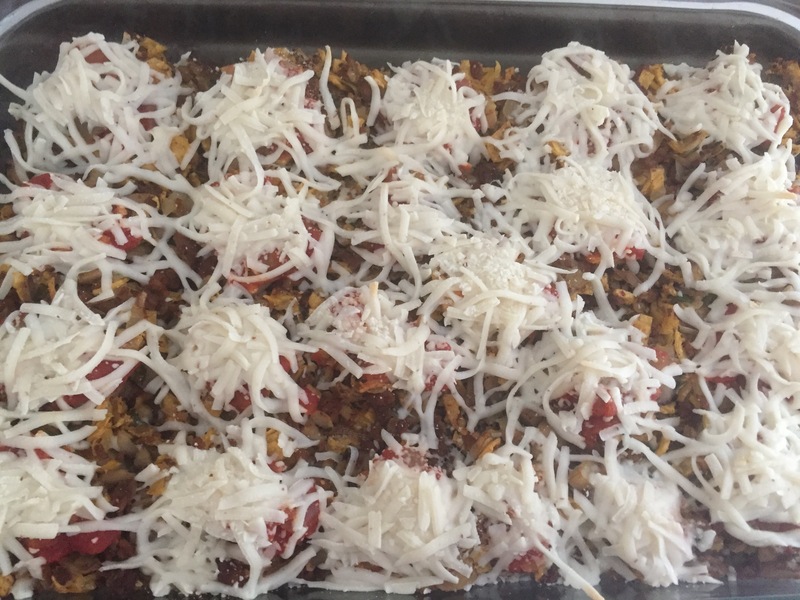 For the last stage of baking I topped each mushroom with some grated vegan cheese and let it melt for few minutes. Finally, I sprinkled some fresh cilantro on top. If you can’t stand cilantro, you can use flat leaf parsley or fresh basil. Although it would make it less of a Mexican flavor and aroma experience, it will still make these mushrooms yummy! Wipe the mushrooms of any visible bits of dirt using a damp paper towel. Remove the stems carefully so that you don’t break the caps. Save the stems for later. Line a baking sheet with parchment paper and place the mushroom caps on, their hole side up. Put them into the preheated oven for 10 to 15 minutes. Spray a large frying pan with cooking spray and place over medium heat. Add chopped onions and chopped chives. Let them brown for about 5 minutes. While the mushroom caps are roasting, and onions and chives are sautéing, chop the stems to small pieces and add them to the pan. Sauté for another 5 minutes then add the beefless ground beef and the seasoning. If you don’t have this specific seasoning mix, you can use store bought taco seasoning, or similar, or just add your own mix of chili powder, paprika, black paper and coriander to taste. Mix everything well together and sauté for another 5 minutes. 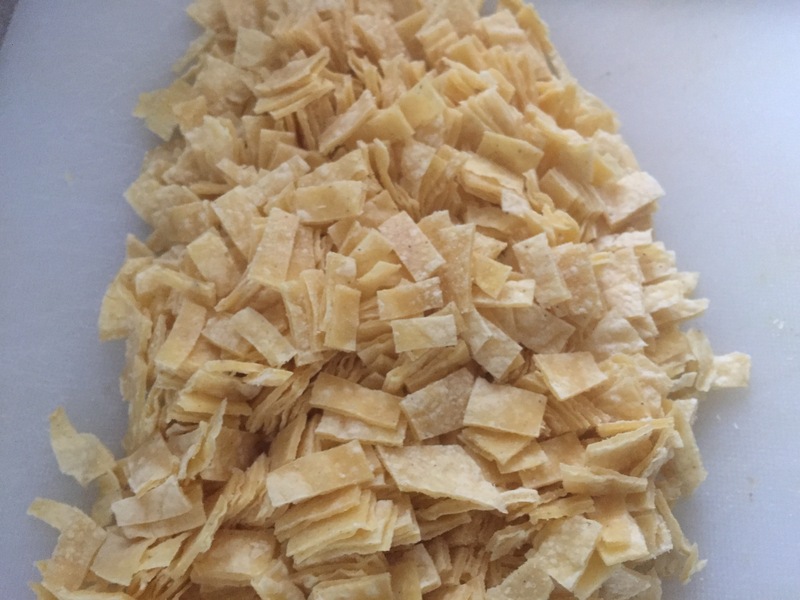 Turn the heat off and mix in the chopped corn tortillas. Let stand for about 5 to 10 minutes. This will help the tortillas soak up some of the excess liquid mushrooms may have released as well as soak up then flavors. Take the mushroom caps out of the oven, and bring the heat down to 350 F (180 C). Using a pair of kitchen tongs, or similar, gently invert the mushroom caps so that the liquid that collected in them drains out. Place the dry mushroom caps into a deep baking dish. Spoon the stuffing into the mushrooms. I like to spoon the stuffing high and if your baking dish is deep enough you don’t have to worry about the stuffing spilling over as there will be a dish to catch it all. Place one teaspoon of salsa on each stuffed mushroom, and then heap the shredded cheese on top. Spray the tops with some cooking spray and place the dish into the oven. Bake for 10 to 15 minutes, until the cheese starts to melt and the mushrooms are completely cooked. Take it out of the oven and cool only slightly. Sprinkle with fresh cilantro, or another herb of your choice, just before serving and enjoy as an appetizer or a part of your main course.